Nuclear energy is taking on an important role in an increasingly carbon-free energy market. As the world moves away from carbon-based fossil fuels, towards cleaner technologies built on renewability and sustainability, now is an opportune time to diversify one’s energy portfolio. Neither solar power nor natural gas can generate the energy required by a global population now close to 8 billion people (and growing). It is now widely acknowledged that it is only with a combination of nuclear and renewables that countries can achieve their decarbonisation targets. Nuclear power provides a compelling option to fill the widening divide between energy supply and demand — and it can do so within a few years, rather than a few decades. Taking all this into consideration, the environment for nuclear power (and its core staple, Uranium) seems commercially fertile for uranium miners operating low cost mines close to end-user markets. Dual-listed on both the ASX and the London Stock Exchange (LSE), BKY’s objective is to be one of the world’s lowest cost producers reliably supplying the world’s leading utilities with fuel for base load clean energy from the heart of the European Union. Once in production the mine will be one of the world’s biggest producers supplying over four million pounds of uranium concentrate a year, equivalent to approximately 10% of the continent’s total requirement. After seeing a decline in uranium prices that began in 2007, it appears that a price floor may now been forming. The recent performance of other uranium bellwethers suggests a nuclear power renaissance could be on the way, which could take uranium prices back to their historic highs. In 2007 uranium was approaching US$140/lb, compared to around US$22/lb today. This is a view also held by industry experts, who believe that we are approaching a supply/demand deficit that will be the largest the world has ever seen. Cantor Fitzgerald believe that the uranium price rise will be ‘violent’. However, at the same time it should be noted there is no hard and fast guarantee that the uranium price will definitely go higher – this is a fluctuating commodity after all. Seek professional financial advice and consider all publicly available information before making an investment in BKY. Cameco, a Canadian producer worth C$5.7 billion, saw its share price rally by more than 40% since the end of October 2016. On a macro scale, China is spending $570 billion targeting 10% of its electricity generation from nuclear and throughout the world more than 60 reactors are currently under construction. Several uranium market analysts have hailed uranium as the world’s best asset in the world’s worst market – but all that is subject to change as BKY has proven with aplomb, by recently signing a binding offtake agreement for its first production at US$43/lb, a 140% premium to current market prices. The effect of BKY’s impressive progress is reflected in its share price; BKY shares have risen from $0.20 AUD per share in May 2015 to $1.105 AUD per share today – that’s a gain of over 400%. Regular Next Mining Boom readers were alerted to BKY back in September when we first covered the stock in the article ASX Stock Set for Spanish Bull Run with Uranium Production , when it was trading at $0.80 AUD per share – today’s share price reflects a healthy 38% gain from our first coverage. 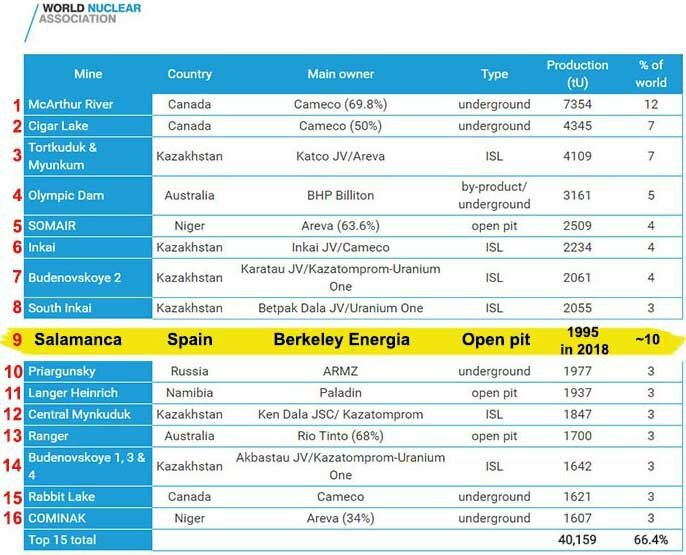 What’s of even more commercial interest, is that BKY’s production costs have been estimated at $13.30/lb which means that even if the uranium market remains lacklustre, BKY is able to generate strong returns at its flagship Salamanca Project in Spain. 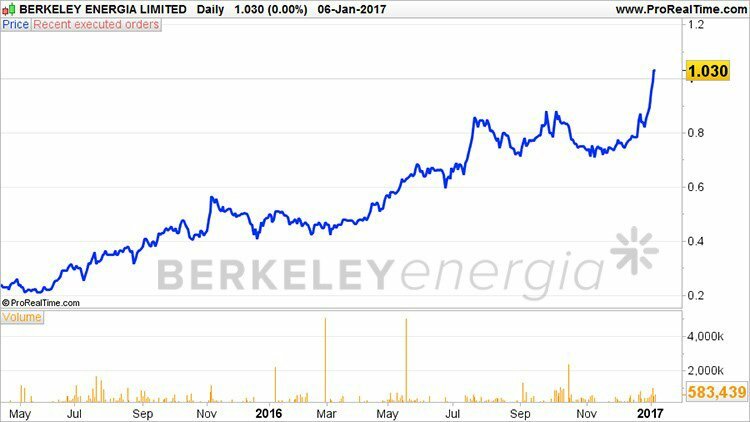 Berkeley Energia (ASX:BKY | LSE:BKY) is nearing its goal of becoming a significant new producer of uranium, just as supply is waning at critically low levels while pipeline demand continues to grow. 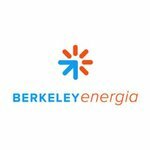 It will be close to perfect timing when BKY comes online as this is the time the US and EU utilities will commence re-contracting for medium to long term supply. BKY is listed on London Stock Exchange’s AIM market and also in Australia on the ASX, which is always a neat benefit, allowing a company access to financing and liquidity from several regions. BKY has now begun constructing the infrastructure for its Spain-based Salamanca Project, expecting to kick-off production sometime in 2018 – by that time we would expect a steady rise in the share price as risk in project delivery diminishes, as BKY transforms into a fully fledged producer. A sturdy Definitive Feasibility Study (DFS) shows BKY can produce uranium at US$13.30/lb, while current prices remain around US$20/lb. It is also worth reiterating here that BKY has a signed binding offtake agreement for US$43.78 per pound of contracted and optional volumes – comparing favourably against the current spot price. The Salamanca mine is located in Spain, a country with excellent infrastructure and a reputation for dependability, thereby avoiding potential problems often found with politically sensitive regions such as Kazakhstan, Niger and Namibia – all significant uranium-producing countries. BKY’s mine is currently the only uranium mine under construction anywhere in the world. This has the potential to put BKY’s production schedule right into the gulf stream of uranium sales in the coming years as conditions adjust to the various factors underpinning uranium demand/supply. Furthermore, BKY expects to see relatively low capital and operating costs compared to any other uranium producer. Operating costs are expected to peak at US$13.30/lb, and when compared to the industry average of US$30/lb, BKY’s production schedule looks very healthy indeed. The fact that current uranium producers have to produce at US$30/lb and sell at US$20/lb may explain the gruelling conditions currently undermining uranium supply. According to BKY’s DFS, the company will avoid this gruel as it will likely commence production in the black from day one. BKY has recorded high ore grades in all of its exploration so far, proving its mettle with a DFS in 2016. 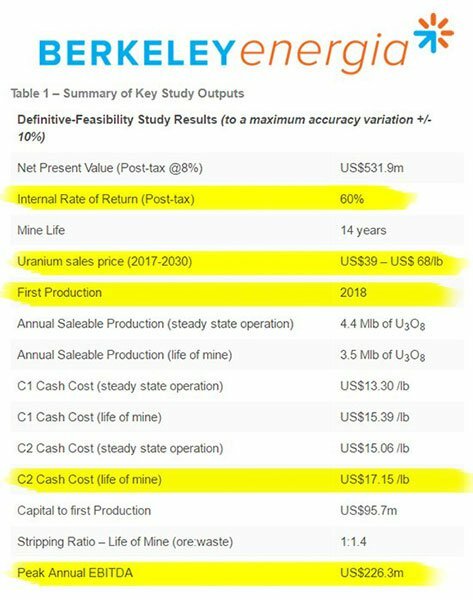 As you can see, BKY is a formidable junior making haste to mature into a profitable uranium producer within the coming 18 months, generating a peak annual EBITDA of US$226.3 million in the process. Yet BKY remains a speculative stock at this stage and has some work to do before it achieves its aim, to mature quickly, so take a cautious approach if considering BKY for your portfolio. 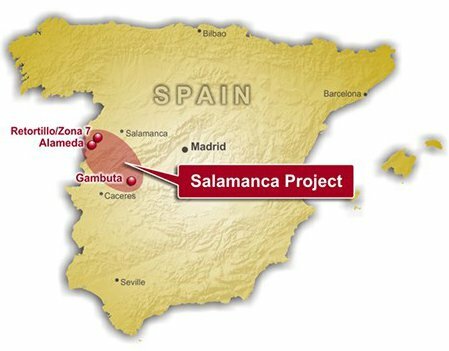 Uranium at the Salamanca Project is confirmed to be close to the surface making deposits easy to access with an open pit mine that is now moving into construction phase. Once in steady state of production, BKY expects to be producing as much as 4.4 million pounds of uranium (1,995 tonnes), making it the 9th largest uranium producer in the world, and the largest in Europe. The Company has seen significant interest from offtake parties and as we mentioned earlier, late last year converted a recent LOI with Interalloys into a binding offtake agreement that doubles previous volume estimates and is at an average fixed price of more than $43/lb. In order to hit the ground running, BKY has just acquired a swathe of land adjacent to its Salamanca Project. Over 500 hectares of land has been acquired to facilitate the construction of BKY’s mine; this is expected to shorten BKY’s path to production by several months compared to previous estimates. Other infrastructure work is also ongoing, including the re-routing of existing roads and power lines. Not long after announcing its land grab, BKY immediately moved to commencing full construction. Crushers and other processing equipment has now been ordered for BKY’s processing plant, which again, helps to shorten project lead times and lowers operating costs. All in all, BKY’s progress and development has enabled it to improve upon its previous Letter of Intent (LOI) with Interalloys by doubling the production schedule to over 2 million pounds of uranium within 5 years. There is also the possibility of BKY expanding its now binding deal to over 3 million pounds subject to further development at Salamanca. A raging tiger from the East, otherwise known as China, is the most ambitious nuclear power proponent globally. China is on course to boost its nuclear power capacity by more than 70% by 2020. Just to reiterate, that’s an expansion totalling 30 nuclear power reactors within the coming 3 years – an astonishing rate of growth that few economies could ever aspire to. In India, another rapidly growing nation, the government plans to expand its nuclear power capacity by around 30% by 2020. In Japan, nine reactors should be in operation by the end of this year and the Russians are currently building seven reactors. Even the enigmatic Donald Trump is proposing state support for the US nuclear industry. It would seem that after a decade of turmoil, infamously catalysed by the Fukushima disaster in 2011, the nuclear industry is turning the corner towards improving its slice of the global energy production cake. After a prolonged 10 year run of declines, world nuclear power generation increased by 1.3% in 2015 – this could be indicative of a proverbial turning of the corner analysts have been referring to. One of the more bullish analyst estimates regarding the future of uranium comes from Willem Middelkoop, the founder of Aerdenhout, a Netherlands-based Commodity Discovery Fund that returned 70% for its investors in 2016. Middelkoop said he expects the spot price to return to at least $US30 in 2017 and rise substantially in the longer term beyond US$100/lb because of the pipeline of nuclear-power projects being conducted globally. Here is a historic look at uranium prices. As you can see, uranium prices can swing to extremes due to uranium’s unique market forces. Uranium prices have traded as high as US$137/lb. and are currently trading close to US$20/lb. 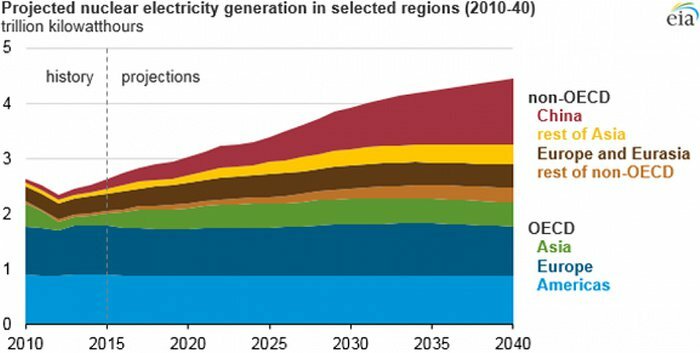 Several analysts think these low levels aren’t sustainable given the expected increase in uranium demand, power consumption, population growth and international conflict deterrents. A nuclear renaissance is gradually coming to the boil, ready to provide opportunistic uranium miners with a healthy feast over the coming years. ...we think that’s an early indicator of future uranium market health. BKY is pushing hard to spearhead the nuclear renaissance, currently being led by BRIC countries China, India and Russia. As we hinted above, even the Americans are coming back around to the idea of nuclear power, inspired by the soon-to-be US President, Donald Trump. BKY has doubled its initial offtake deal at US$43/lb while its production costs will remain at US$13.05/lb, which bears close to surface deposits that can be carried out through an open-pit mine (the most cost-effective method of uranium mining). Low demand and high supply means that uranium prices have continued to fall in recent years. But now, the combination of existing supply contracts coming to an end and more reactors coming on stream, should ensure a much brighter future for speculative uranium investors. However there is still some way to go before BKY enters production and anything can happen in this time. If considering BKY for your portfolio seek professional financial advice. Nuclear power may have a chequered history, but its future as a staple of total global energy production is without doubt. Very few parts of the world can get away with turning exclusively to renewable sources for their emission free power, most large countries are struggling to evade carbon fuels and are ramping up nuclear power to ensure fossil free energy security. ...and BKY is on course to take a prime position as the largest uranium producer in Europe and the 9 th largest globally by as early as 2018.